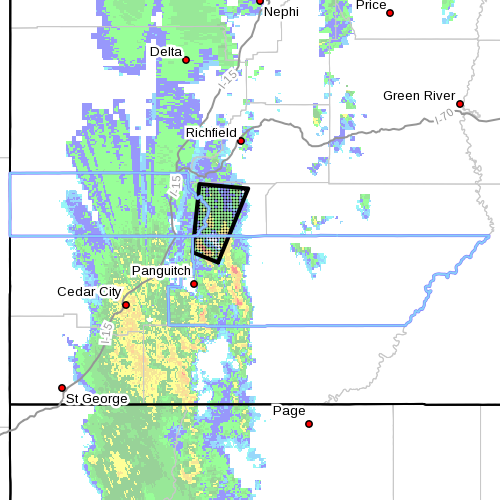 SOUTHERN UTAH – The National Weather Service has issued a significant weather advisory for western Piute, southeastern Beaver, northwestern Garfield and northeastern Iron counties, in effect until 1 p.m. Saturday. At 12:29 Doppler radar indicated a strong thunderstorm 9 miles north of Panguitch or 22 miles southwest of Junction moving north at 50 mph. Nickel-size hail and winds of 40 to 55 mph will be possible. Locations impacted include Junction, Marysvale, Circleville and Kingston. If threatening weather approaches, take shelter in a sturdy building. This storm may intensify, so be certain to monitor local news for additional information and possible warnings from the national weather service.